I’ll be the first to say George is the best pup on the planet, but my little guy needed some training. When Nate told me he signed George up for puppy class with Anything Is PAWZible, I was excited. When we started class, I was still a little timid around George. Nate would put him in the car, he felt more comfortable doing tricks and commands with him, and I was more the “supportive mom”. Over six weeks, George would learn how to sit, side sit, wait (his best skill! ), come (the most important! ), and more. We are still working on down, but I’m confident George will get there. Nate and I learned house training tips, received behavioral advice, and the importance of loose-leash walking. Every week, we got our homework assignments to keep George, and us, working hard on his lessons. Rendy, our class trainer and the owner of the company, was a wonderful teacher. She was patient and so kind to George, which I really appreciated because George loved her. Rendy answered any of our questions and always made herself available if we needed her (she said to continue to contact her, so we might take her up on that). The classes were fun, challenging, and well-balanced between skills and play time. 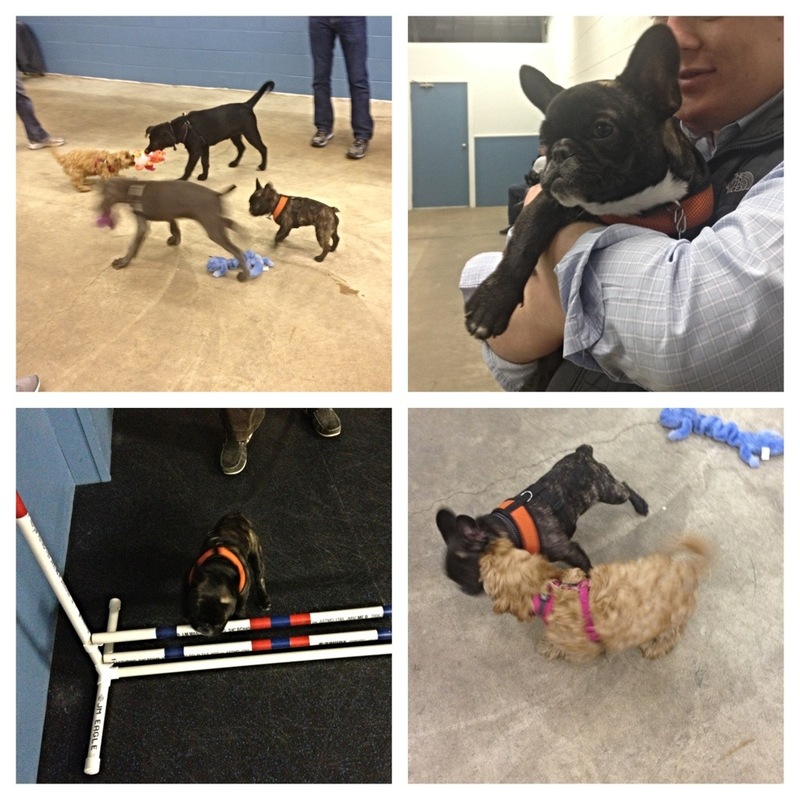 Our classes were held at Active – Dog Daycare and Boarding on Diversey near the expressway. Honestly, I’m not sure who was more excited for class, George or Nate and me. I loved seeing the other dogs in our class–Penny, Saison, Pappy, and Gracie–and how they grew and learned from week to week, and how well they all played together with George. It was also fun to chat with the puppy parents, finding out what’s going on with their puppies, and sharing in their successes. 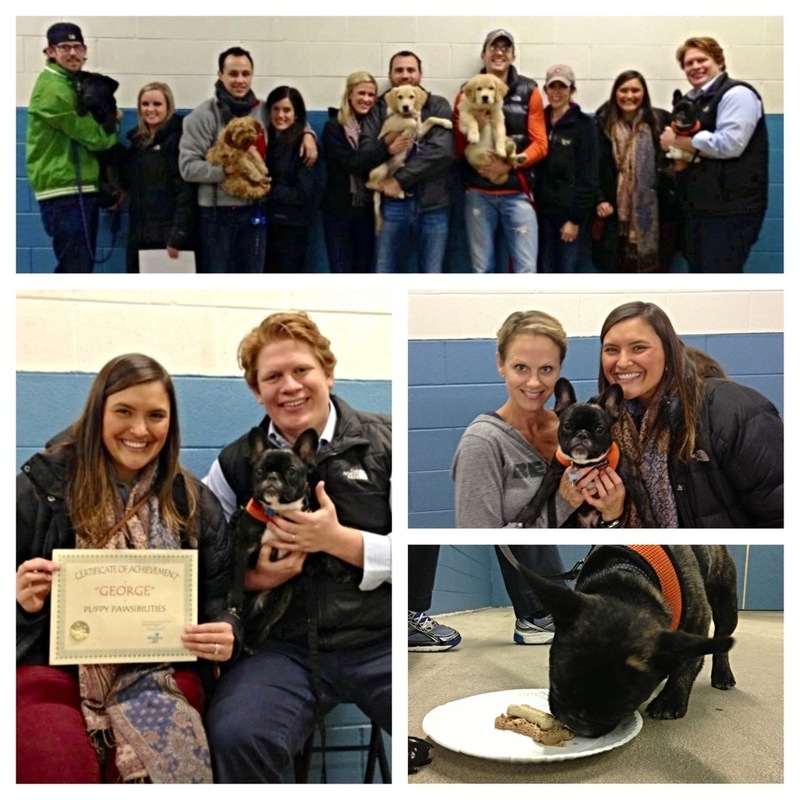 This week during our last class, we did a skills quiz, the pups picked out toys, ate puppy cake (it’s not real cake! ), and received certificates. Some photos from our last class are included below! I honestly can’t say enough positive things about this experience. I’m not sure who learned more: me or George. I highly recommend Anything Is PAWZible. I hope we sign up for our next class soon, and hope that this isn’t the last that we see of our new classmates friends.